We're not just a hotel! The Holiday Inn Express Grand Rapids South offers travelers a comfortable, enjoyable, and restful stay. Beautifully appointed rooms and countless amenities make the Holiday Inn Express Grand Rapids South one of of the areas most preferred travel destinations. Built in 2004, this beautiful four story brick structure sits in a very quite business cul de sac and offers a perfect blend of leisure and business amenities. Conveniently located off US 131 at the M6 interchange, the Holiday Inn Express South Grand Rapids is a short walk to fast food restaurants, and parks. Tanger Outlet Mall is just 2 short miles from us and River Town Crossings, one of West Michigan's largest shopping malls, and fine dining establishments are within 10 minutes of our location. The on ramp for US 131 and M6 are only a block away and you can reach almost any part of metro Grand Rapids within 10-15 minutes, including Gerald R. Ford International Airport. If you want to stay in and relax, the Holiday Inn Express South offers many wonderful amenities. How about a 10,000 sq foot pool area with splash pad? 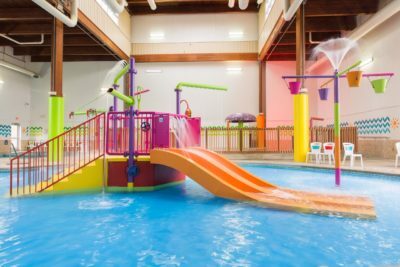 The Splash Pad is attached to the hotel and features a zero depth toddler play area with tipping buckets and slides, a vortex pool, and offers a smaller swim area for big kids! Of course you can simply relax in our adult hot tub too. If you're looking to burn some calories off stop by the hotel fitness center, and don't forget our business center with free high speed internet access is open 24 hours a day.